When it comes to your home, there are few things of greater importance than the roof over your head. A good roof will keep the rain and snow out and will keep heat inside during the winter and outside during the summer. While many of us take our roof for granted, it requires maintenance, just like any other part of your house. It is important to keep in mind that many factors can damage your roof, including the extreme weather we experience throughout the Chicagoland area. 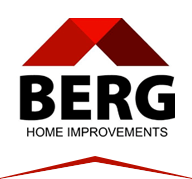 Whether you are looking to replace a few shingles after the windy season, or water damage has destroyed your roof, Berg Home Improvements has you covered, as we’ve covered so many others. Contact our roofing specialists today to learn how we can help improve your home. There are numerous reasons you might need help with your roof. Many weather-related issues are common throughout our area, and windy days can tear off your shingles, exposing your roof to further environmental damage. Heavy rain — especially for roofs that are already damaged or exposed — can cause extensive water damage and rot your house’s infrastructure. During the winter, lake-effect snows can build up on your roof and put a huge strain on your home, while freezing rain can work into the cracks between your shingles, causing them to crack. Animals also tend to look for a warm place to shack up and can damage your roof trying to get in. Finally, falling trees and limbs can cause damage, from simple cosmetic scrapes to significant structural damage. Even if your roof hasn’t been visibly damaged, having regular roofing evaluations can help you avoid unseen long-term problems. Total Roof Replacement – Whether you want or need a replacement to your outer layer, or complete roofing replacement, we’ve got you covered. Shingle Repair and Replacement – Sometimes the outer layer of your roof could be better suited to the local weather — or needs a cosmetic upgrade. We’re happy to offer a range of shingle materials and flat roofing to enhance the safety and beauty of your house. Residential and Commercial Roofing – Whether you need new roofing for your home or business, we have the products and experience to get the job done right. Inspections – Damage to your roof is not always immediately visible, and our roofing experts are happy to inspect your roof and give clear, unbiased recommendations. We are a family owned business and understand the importance of great service. We strive to offer our customers the highest value in the industry. We have many successful jobs under our belt, and we would love to help you too. If you are interested in our services, contact us to schedule a consultation. You can also reach us by filling out our online contact form and leaving a brief description of what you would like worked on. We look forward to helping you with all your roofing needs!